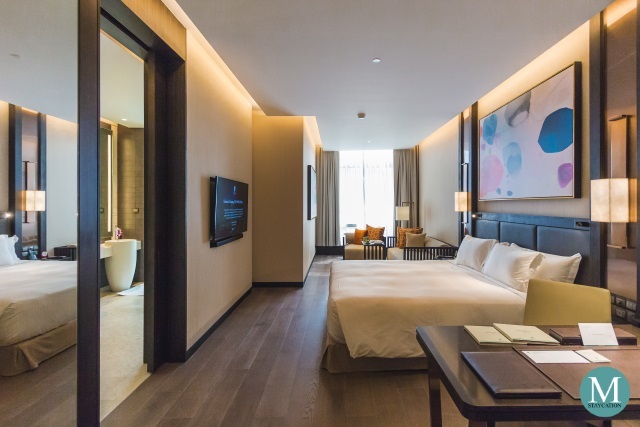 Measuring between 63 to 67 square meters, the Signature Banyan Retreat is the most spacious among the three guestroom categories of Banyan Tree Kuala Lumpur. The room's interior feature the use of hard wood, marbles and patterns inspired by nature, creating an understated and naturally luxurious feel. As you enter the room, you will be welcomed by a foyer with a beautifully designed partition with leaf-shaped holes. A luggage rack is conveniently located in the foyer which is the perfect storage for your day bag. Next to the luggage rack is the minibar with drinks stored inside the mini refrigerator and snacks inside the drawers. Cafés Richard is a Paris-based coffee roasting company, and right here at Banan Tree Kuala Lumpur, hotel guests can enjoy the traditional French way of drinking coffee through the in-room Cafes Richard coffee machine. During my stay, I was able to enjoy freshly made espresso in the morning and coffee in the afternoon. 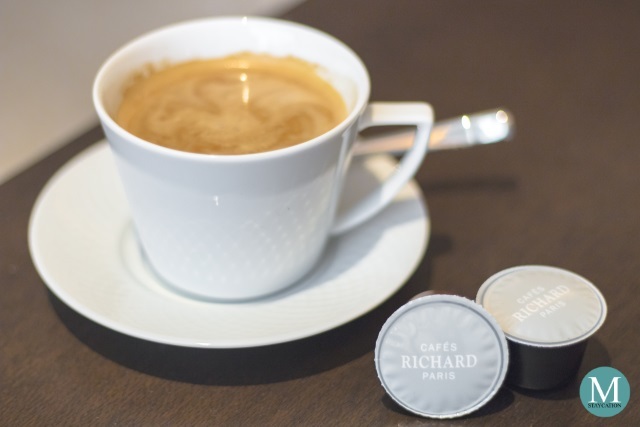 Complimentary Cafes Richard capsules are provided and replenished daily. The Signature Banyan Retreat is available in a king or twin beds configuration. 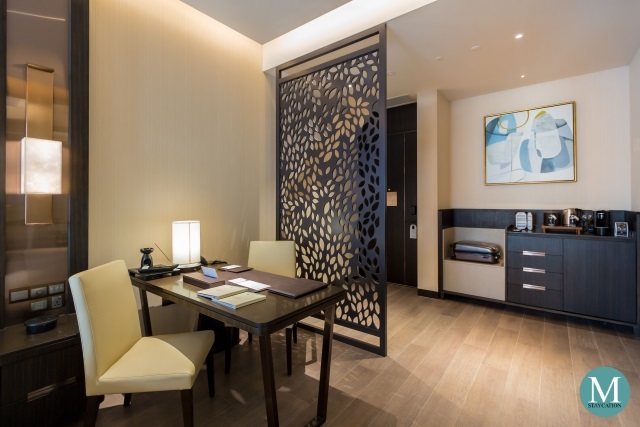 The room is also furnished with an executive writing desk with plenty of power outlets on the side wall. There is also a seating area next to window with two sofas and a center table. I particularly like the table which can serve as a dining table or as a laptop table. The room I stayed in faces the Kuala Lumpur Tower. Located 55 floors above the ground, I enjoyed an unobstructed view of the city. 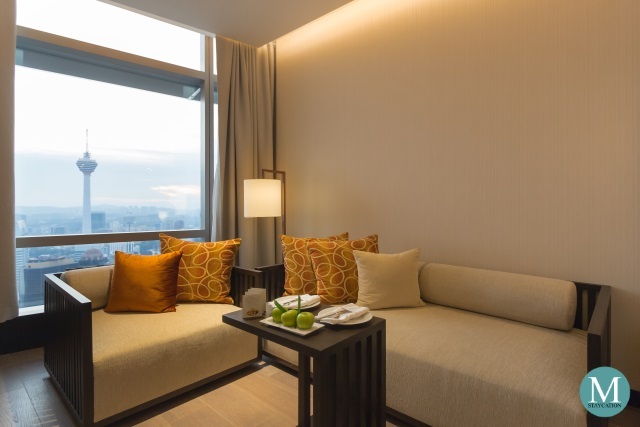 The seating area is also the best place to watch the sunset in the privacy of your room. 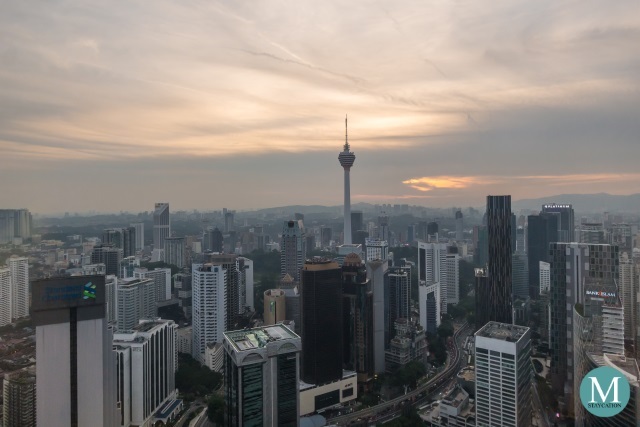 If you love the sunset, make sure you request a room facing the KL tower. 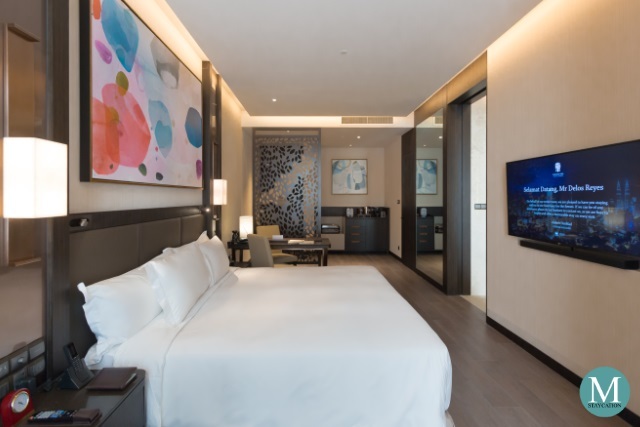 The Signature Banyan Retreat is equipped with a 55-inch Smart LED television installed with sound bar and loaded in local and international cable channels. 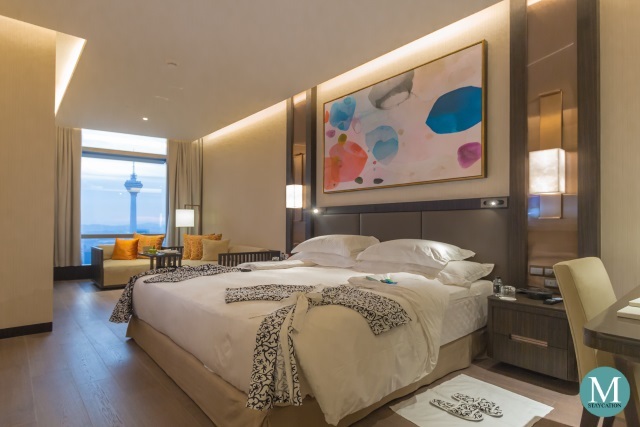 The bedside controls allow guests to draw the sheer and blockout curtains and to adjust the in-room light settings. Turndown service starts right after sunset. 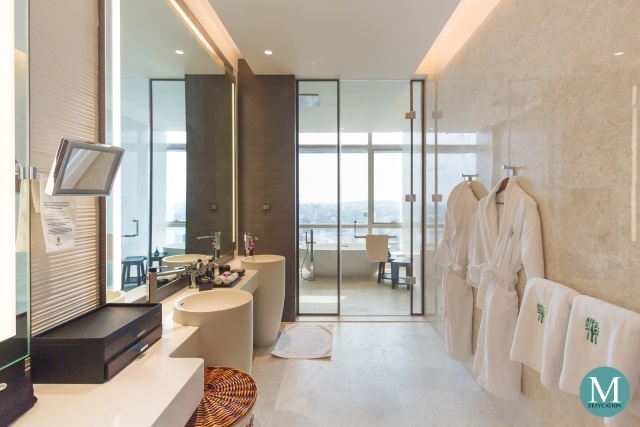 The nature-inspired design of the hotel also translate to the bath accessories of the room. The kimonos for example has a seaweed-inspired motif, with lighter share for women while the darker shade for men. Take note however that the bedroom slippers (with the same seaweed motif) are for room use only and are available for purchase should you wish to bring them home. 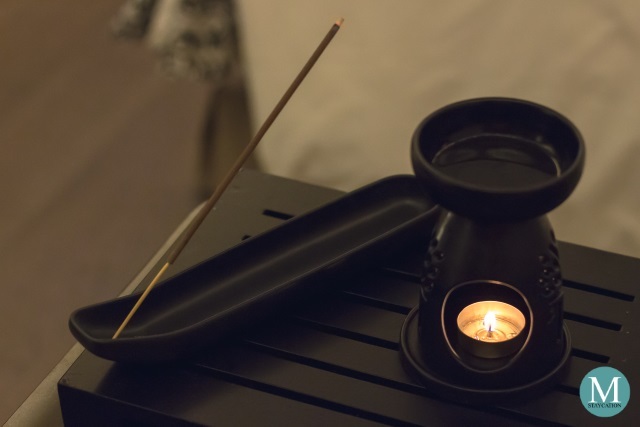 A unique experience which Banyan Tree Hotels & Resorts offer to its guests is the personalized in-room aromatherapy set consisting of an oil burner and an incense. Upon check-in, guests will be asked to choose an essential oil scent and an incense scent. You may choose a different scent per each day of your stay. The front office staff will be happy to provide you with their recommendation. The aromatherapy set is prepared during turndown service, filling the room with the relaxing scents of the essential oil and incense. This is perfect after a tiring day at the office or exploring the city. If the oild burner dry up, just add a small amount of water to the oil. Two pieces of candles are provided, but feel free to ask for more if needed. 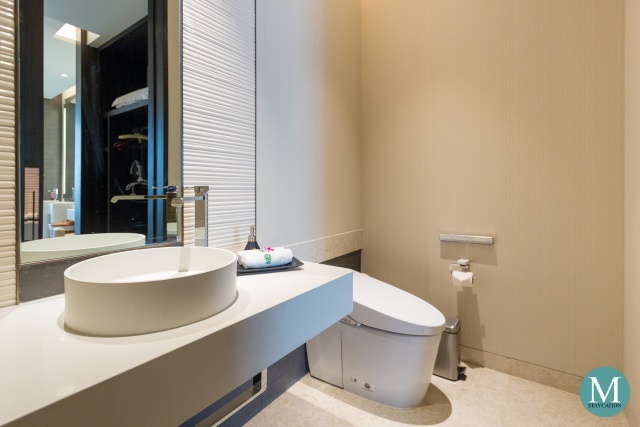 As you may have already noticed, about a third of the room is dedicated for the bathroom which is divided into three sections. A door at the room's foyer leads to the lavatory. The toilet is fitted a Japanese toilet seat with water cleaning and drying functions. 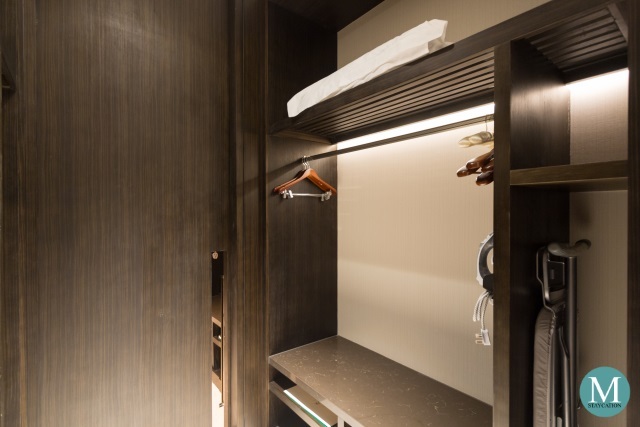 A sliding door at the lavatory leads to the walk-in closet. There is a luggage rack and an open cabinet with wooden and satin padded hangers. There's also an iron and ironing board stored inside the closet, together with an electronic safe. From the walk-in closet, another sliding door leads to the marble bathroom. There is a vanity and two sinks. 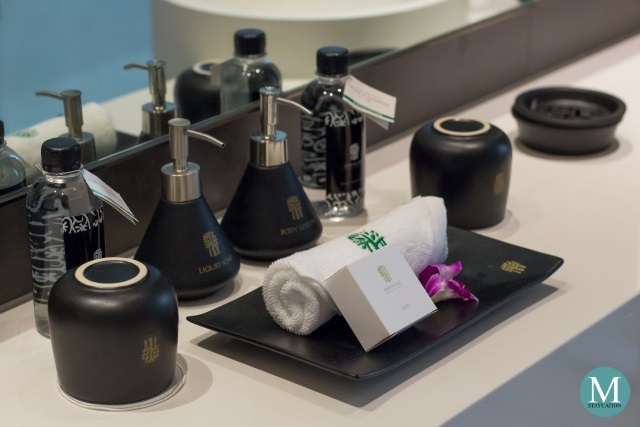 Being an eco-friendly hotel, body and bath amenities are provided in refillable ceramic containers. This helps minimize the plastic waste of the hotel. High quality towels and bathrobes are also provided. 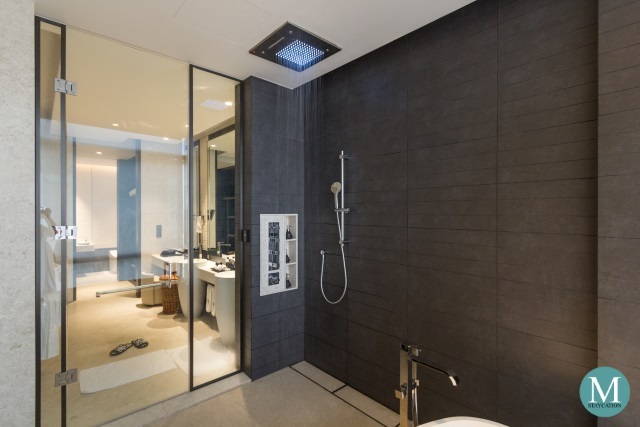 The highlight of the room has got to be the walk-in shower, starting with the huge rainfall shower mounted to the ceiling. This is also the first hotel I stayed in where the shower has mood lighting. As mentioned in this article, shower gel, shampoo and conditioner are placed in refillable ceramic containers. 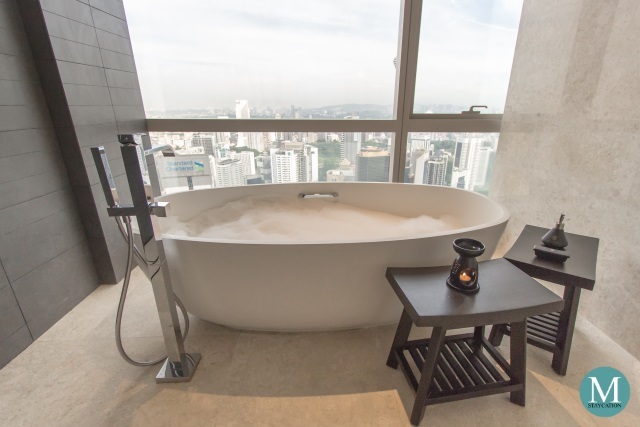 Next to the glass wall window is an oval deep soaking tub where I enjoyed a relaxing warm bath in the morning after breakfast while admiring the views of the city. I also used the oil burner inside the bathroom to elevate the bath experience. The Signature Banyan Retreat is perfect for business travelers to de-stress after a busy day at the office. 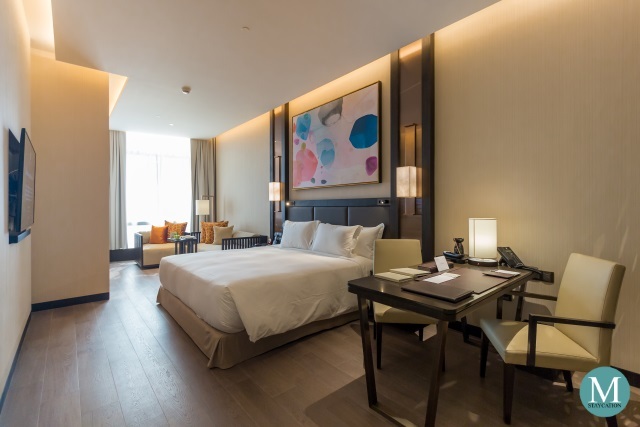 It is also perfect for staycationistas who wish to escape the hectic city life, and for leisure travelers who are looking for a relaxing end to their adventures in KL.